This patch also includes changes that will be released to live servers later this week. Our next Heroes of the Storm patch has just arrived to the Public Test Realm and will be available for playtesting until September 25. During this time, we kindly request your assistance in trying out some of the new content it contains before we officially release the patch to the live version of Heroes. Just like last time, if you encounter any bugs or other issues during your PTR play sessions, please stop by the PTR Bug Report forum to let us know about your experiences. Open Loot Boxes and be the first team to find the Golden Pachimari! At the beginning of a match, Loot Boxes will spawn around your starting area. Open as many as you can, and try to find the legendary Golden Pachimari! Opening a Loot Box will grant you a movement speed boost, enabling you to open even more boxes. The player to open the most Loot Boxes on each team will be announced when the event ends, so be sure to always try your best! The first team to find the Golden Pachimari will win the event and earn credit toward their Pachimari Mania quest progress! Pachimari Mania is a four-part quest chain. All quests must be completed in order, and only one quest will be active at a time. 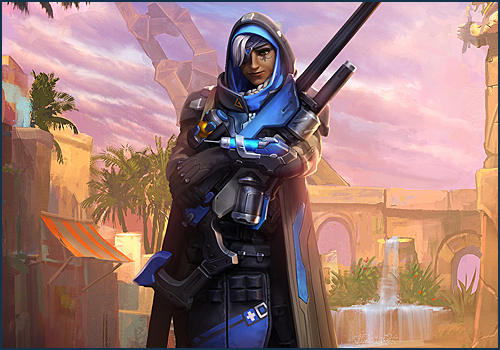 As a founding member of Overwatch and one of the world's best snipers, Ana Amari uses her skills to protect the innocent. Though she went MIA after losing her eye, Ana's sense of duty and responsibility has brought her back to the fight. Basic Attacks apply a Dose to non-Structure enemies, dealing an additional 44 damage over 5 seconds, stacking up to 5 times. Fire a dart which heals the first allied Hero hit for 250 Health. Toss a Grenade at the target area. Allied Heroes hit are healed for 175 Health and receive 25% increased healing for 3 seconds. Enemies hit take 60 damage and receive 100% less healing for 2 seconds. Fire a dart that Sleeps the first enemy Hero hit, rendering them unable to act for 3 seconds. Sleep’s effects end instantly if the target takes damage after the first 0.5 seconds. Cannot be used on Vehicles. Cannot be used on Ana. Assume a sniping position, gaining the ability to fire up to 8 specialized rounds with unlimited range. Rounds hit the first allied or enemy Hero or enemy Structure in their path. Allies are healed for 300 and enemies are damaged for 175. Deals 50% damage to Structures. Ana is unable to move while Eye of Horus is active. Throughout the match a Control Point will activate at one of three locations, beginning in a neutral capture state. Once a player stands on the control point without any enemies, they gain control progress for their team at a steady rate. If an enemy enters the point, the point becomes contested and will not gain or lose control progress. When a team's control progress hits 100, they gain control of the point. As long as a team has control of the point, they gain victory progress at a steady rate. Victory progress does not decay for any reason. Overtime: When a point is at 99% victory progress about to tick over to 100%, it will stay at 99% and enter the overtime state if there are any enemy heroes on the point or the point just flipped from the enemy's control. When a team's victory progress hits 100%, they win the event. The control point deactivates and a two-person Triglav Protector spawns on the point for the winning team after a short delay. Launch a Rocket Fist that impacts the first Hero or Structure hit. Roots Heroes for 1 second. Disables Structures for 2 seconds. Destroys all minions in its path. 14 second cooldown. Grants 25 armor to vehicle and grants a Shield to all nearby allies equal to 25% of their maximum health. 16 second cooldown. Enables the Particle Cannon ability and increases its range over 3 seconds. Reactivate to launch an orb dealing damage in an area. 5 sec cooldown. Fires a barrage of cannon fire at the location of your cursor for 4 seconds. 11 second cooldown. A laser quickly cuts a line across the terrain dealing light damage. A secondary explosion triggers 0.75 seconds later for heavy damage. 10 second cooldown. A sandbox version of Volskaya Foundry has been added to Custom Games. Much like Sandbox version of Cursed Hollow, this Battleground allows up to 10 players at once to use a variety of “cheats” to test the limits of their Heroes, and the Battleground. Sandbox Volskaya Foundry also features a “Triglav Protector” button, which allows a player to immediately spawn a Protector at their Hero’s location. AI Heroes will now perform more dynamic strategies. Read our recent blog, “Under the Hood: AI” for an in-depth look at these and upcoming AI improvements. Voice lines that have been selected for use in players’ Loadouts have had their volume increased in-game. Now have a larger 3D falloff, increased sound exclusivity, and can interrupt other voice lines. Banners that are placed after completing an objective, capturing Mercenaries, etc., will now display the name of the player who owns that Banner. Increased and Decreased Healing indicators have been added and will now appear next to Heroes’ healthbars when they are affected by healing modifier effects, such as Ana’s Biotic Grenade. Hero icons on the Minimap now indicate which direction that Hero is facing. A new “Play 2 Games as an Overwatch Hero” Daily Quest has been added. Players under level 5 can no longer whisper non-friends using chat channel player lists. However, players under level 5 who receive a whisper from a non-friend can whisper that player back. It should now be easier to differentiate between Owned and Unowned Items in your Collection. Additionally, item prices are now always displayed on unowned items. Item backgrounds and borders have received visual improvements and rarity coloring to help players more easily distinguish between items of different rarities. Now has a unique minimap icon. Developer Comment: These changes are designed to increase the power of Insight and Transcendence by shifting more of Kharazim's healing power pie into them. We want to encourage the same active gameplay that Iron Fist Kharazim's have, but increasing healing and utility instead of damage when the other Talents are chosen. Developer Comment: We'd like to make positioning for Rehgar's Chain Heal matter more, so that we reward players and teams that can get the most of it. To do this we're reducing the range and radius of the heal, while also making the jumps a greater portion his overall healing. Brushstalker (Z) will now go on a 10 second cooldown when interrupted by enemy or allied abilities. Now applies a 50% slow for 2.5 seconds after enemies are knocked into the air. Hitting 2 enemy Heroes with Punish causes the slow to be increased to 80% and no longer decay. !Quest: Hit 4 enemy Heroes with a single cast of Punish. !Reward: Punish now always slows enemies by 80% and no longer decays. Developer Comment: To her credit, Johanna has not needed many changes since she was first released into the Nexus. Her talent pick and win rates have been fair compared to most heroes, and she has almost always had a place in the meta. While she is not in dire need of changes, we saw an opportunity to spruce up her talent tree and give her some more interesting options to choose from on various tiers. Loot Chests purchased via the Loot tab will now only grant Rare Loot Chests, rather than Normal Loot Chests. Please note: This only applies to Loot Chests purchased after this patch is applied to the live version of the game in each region. Normal Loot Chests the player already owns will not convert to Rare Loot Chests. The Celestial Steed Mount has been removed and replaced by the Celestial Raptor as a reward for purchasing Loot Chests. The 1,000 Gem reward for reaching level 5 has been removed. Please note: Veteran players who have not logged in following the release of Heroes 2.0 earlier this year will no longer be able to claim this reward once this patch is applied to the live version of the game in each region. The Welcome Bundle has been removed from the Collection. Celestial Raptor – As mentioned above, this Mount is awarded upon purchasing Loot Chests with Gems. Zeratul: Zeratul’s mask will no longer stretch and bend oddly during Hero Select or in the Collection on low graphic settings. Try Mode: The You Want Axe? Talent will now correctly grant bonus Basic Attack range after using the Complete Quest button. Try Mode: Garrosh will no longer continue to benefit from the Warbreaker Talent after clicking Reset Talents. Try Mode: Toggling off Minion spawns will no longer cause AI Heroes to wait at their Fort Gates indefinitely. Alarak: Rite of Rak’shir will no longer be placed on a dead target if it was cast just as that target took fatal damage. D.Va: Using Boosters to smash destructible barrels on Blackheart’s Bay will no longer place the Ability on full cooldown. D.Va: Fixed an issue that could cause D.Va to inconsistently activate Healing Wells while using Boosters. D.Va: Dying while casting Call Mech will no longer create an untargetable Mech that persists until D.Va respawns. D.Va: Mech deaths that occur while no enemy Heroes are nearby will now correctly grant XP and update D.Va’s death count on the in-game score screen. D.Va: A Nuke’s area of effect indicator will no longer disappear if D.Va finishes channeling Nuke in the same moment that her Mech is destroyed. Garrosh: Wrecking Ball will no longer end Rehgar’s Ghost Wolf. Garrosh: Using Body Check with the Brute Force Talent on a Boss no longer causes the Healing debuff icon to appear next its Health bar. Garrosh: Bloodthirst will no longer cause Garrosh to automatically retarget his Basic Attacks to the closest enemy. Genji: Fixed an issue that could prevent Fort attacks from Slowing Genji if he has Dodge charges remaining, and there is another Genji on the opposing team. Genji: Fixed an issue that could cause Dodge to behave inconsistently against Sylvanas’ and Lunara’s Basic Attacks. Jaina: Fixed an issue that prevented Jaina from casting Water Elemental if unpathable terrain existed between Jaina and the desired casting location. Jaina: Fixed a typo in the Icy Veins tooltip which incorrectly stated that the Talent provided a 300% cooldown recharge rate , rather than 200%. This only affected the tooltip, and the Talent's functionality has not changed. Johanna: Abilities that block pathing, such as Sonya’s Arreat Crater and Tassadar’s Force Wall, will no longer block Johanna’s movement during Falling Sword. Probius: Floating Combat Text will now indicate the amount of Shields granted to Probius by a Pylon after learning Shield Battery, rather than displaying zero for each tick. Stukov: Abilities that move Heroes, like Alarak’s Telekinesis and Stiches’ Hook, no longer remove Weighted Pustule from the affected Hero. Sylvanas: Withering Fire can no longer target destructible barrels on Blackheart’s Bay. The Lost Vikings: Casting Longboat Raid immediately after one of the Vikings is killed will no longer prevent the player from using Mortar during the Heroic Ability’s duration. Tychus: The That’s the Stuff! Talent’s Heal indicator will no longer disappear if Tychus stops attacking before Minigun expires. Valla: Enemy Heroes who were broken out of Stealth by Hungering Arrow can now correctly be hit by subsequent Hungering Arrow strikes. Valla: Caltrops dropped by the Vault Talent will no longer display Health bars, and are no longer selectable. Zagara: Creep Tumors no longer exhibit a short delay before granting vision of the area affected by Creep. Li-Ming: Templar Li-Ming will now correctly play death sounds when killed. Valeera: Enemy Heroes will no longer hear when Valeera primes her activated Talents, like Crippling Poison, when she is Stealthed. Hotkeys: The Dragon Knight and Garden Terror will now correctly follow Force Move commands.